BAKTRAK Rubber Grip Panel Ultra Durable and Lightweight Hypalon Construction Hex Panel to Attach Accessories Quick Adjust with Cam Lock Buckle .. The Baktrak technology is designed to reduce sling related noise as well as provide Extreme Grip with the rubber tread grip backing. 1.25" heavy duty webbing and a thumb loop is quick to adjust with only one hand. Mossy Oak Break-up Camo. Nubuck leather face with accent stitching. .. The Baktrak technology is designed to reduce sling related noise as well as provide Extreme Grip with the rubber tread grip backing. 1.25" heavy duty webbing and a thumb loop is quick to adjust with only one hand. Mossy Oak Break-up Camo. .. Constructed of lightweight rubber and heavy duty webbing. 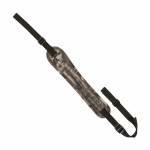 Rubber form grip is non-slip, web sling adjusts up to 39" long. Includes swivels .. The Buckley Tactical Sling is a convertible, single to two point attachment sling with quick snap hook attachment and elastic covered hooks. Heavy weight web construction with hardware tested to a 200 pound load. Adjusts to 50″. .. The Glenwood Sling is the perfect addition to any rifle. The design features lightweight foam padding that gives great support with minimal weight. To prevent slipping off the shoulder, the surface against the body is textured, providing grip against the shoulder. 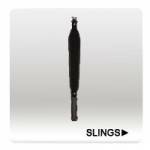 The sling is fitted with Allen Magnum swivels, the strongest production swivel in the USA. 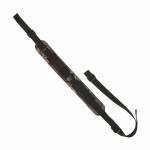 Dimensions: Pad is 15" long, and the overall sling adjusts up to 38"″ when fully extended. ..
* Ergonomic shape and multiple cushion design for comfort * Non-slip lining .. 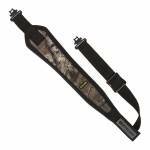 The Hypa-Lite Prowler Gun Sling is a sling designed with predator hunting in mind. The sling begins with ultra-durable and lightweight hypalon construction with molded, low-density foam and a non-slip backing. The front of the sling features Realtree MAX-1 camo in quiet fabric, plus multiple storage pockets for your windicator, mouth call, and diaphragm call or other small accessory. The body of the shoulder pad is 14" long by 3.25" wide, and the adjustable web sling is 1" wide. 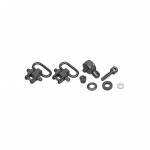 Includes D-r..
Allen Magnum 1.25" Sling Swivel Set. 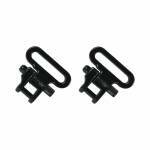 Black heavy duty swivels for 1.25" wide slings. Tested to over 300 lbs. Locking screw provides a rock-solid attachment. Set of two. ..
Swivel set for Pump and Semi-auto Shotguns without hardware installed. Includes necessary hardware to install swivels into most pump action and semi auto shotguns. Designed to work with wood or synthetic stock. A rotating stud that requires drilling the factory magazine tube cap is included for attaching the fore end. .. Features a neoprene pad with a non-slip backing and 4 elsatic cartridge holding loops. Mossy Oak Break-up Country Camo. ..
* 4 Elastic shell loops * Thumb ring loop * Heavy duty web construction * Mossy Oak Breakup ..
BCMGUNFIGHTER KeyMod Quick Detachable Sling Mount. Low-profile for increased mobility and decreased "snag" factor Fits standardized KeyMod interface mounting holes Fits standard push button, quick detach sling swivels (not included) 8 position, 360 degree, non-rotational locking interface Requires three KeyMod attachment hole mounting points All steel construction .. Unique single point black rifle sling is constructed of high-strength 1.25" wide nylon webbing with an elliptical bungee for comfort and support. Sling adjusts from 46" to 64" in diameter to fit all body sizes and around bulky vests or gear and features robust bar tacking and box stitching for maximum strength. Compressed nylon sheathing limits bounce and enhances retention. Elastic-encased MASH clip for quick, positive attachment. 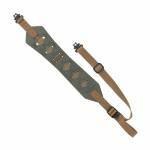 Heavy-duty tri-glide buckle, metal oval ring and single 300-lb t..
Single-point sling is constructed of high-quality 1.25" wide nylon webbing and features dual 300-lb test side-release buckles for quick detach. Elliptical bungee provides comfort and support while compressed tubular nylon sheathing limits bounce and enhances rention. Sling allows 4" flex for weapon agility and adjusts from 46" to 64" in diameter with a heavy-duty tri-glide buckle and metal oval ring to fit all body sizes and around bulky vests or gear. Features a removable, elastic-encased MASH ..
Versatile three-point sling is constructed of high-quality 1.25" wide nylon webbing and features a quick cam buckle for rapid one-hand adjustment. Sling features a heavy-duty tri-glide buckle, metal oval ring and 300-lb test side-release buckle for quick sling attachment & removal. Fully adjustable, ambidextrous design is ideal for fixed or collapsible stocks and allows more than 60 possible configurations and quick shoulder-to-shoulder transitions. Coyote Tan. 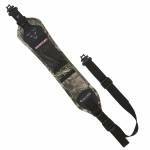 ..
Blackhawk Tactical Releasable STRIKE Sling. 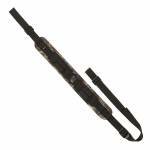 Made with heavy-duty eliptical bungee and tubular nylon webbing, this fully-adjustable tactical sling features a metal snap hook at both ends for convenient attachment to most weapon systems, brackets, attachment buckles or even STRIKE webbing. Adjustable design to fit all operators Side-release buckle for quick firearm attachment and removal Secure three-point cop-lock buckle in the middle for easy weapon removal from attaching point on ves..
Adjustable two-point shotgun sling is constructed of 2" wide nylon webbing. Elastic strap is designed to carry 15 shotgun shells for easy access. Easily attaches to standard sling swivels with durable steel spring hooks. ..